Snow was falling at the beginning of my walk this morning…bliss! The kind of bliss that is all fluttery on the inside and peaceful on the outside. The kind that makes you say to your husband and kids, “Isn’t this lovely?” in hushed tones, almost like reverence. It was not expected nor forecasted. A “petit cadeau” to start the day with a bit of wonder, a bit of hushed bliss. Yet as I walked, a small sliver of aqua opened up in the laden clouds. That small sliver has now multiplied and chased away the flurries. I wish it had lasted longer. The strange thing is that I awoke with a snowflake design in my head wanting to get out. I sat in the early morning with coffee in one hand and crochet hook in the other while my middle schooler got himself ready to catch the bus. I was inspired by this snowflake hanging in one of Alicia Paulson’s windows, and wondered if I could crochet something similar in shape. 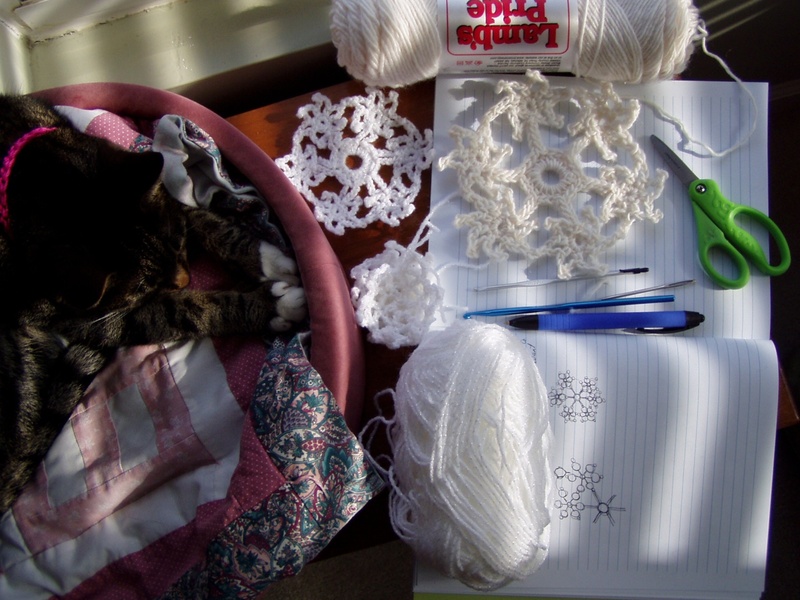 I’ve been thinking a lot about snowflakes lately…was asked last week to talk to the students at the school where I teach art; and snowflakes is the “theme” for the first grader’s chapel this Friday. I’ll share those thoughts with you in an upcoming post. This must be why I woke with a snowflake design flurrying around in my head. There are many things, it seems, that come into my life unexpected and unforecasted. Some of them are not fun, not beautiful, not what you would call hushed bliss. But there are so many MORE things that flurry briefly or lingeringly into my life that I simply don’t take the time to appreciate, to savor, to hold onto, to revel in. I’m going to look for some of these today, and tomorrow, and I hope, the next day. I’d love to hear what some of your unexpected, unforecasted lovelies are. P.S. 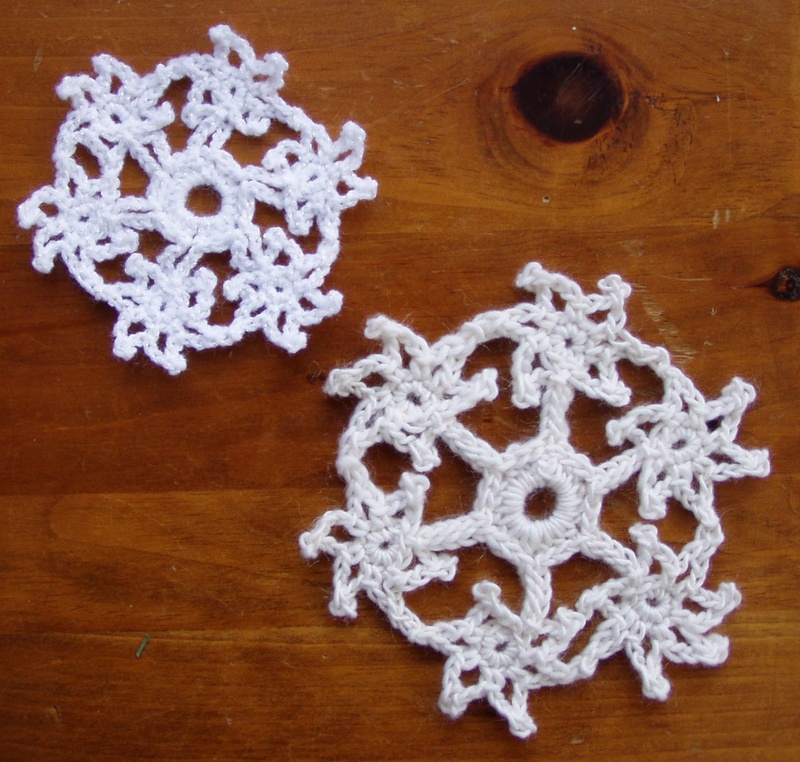 I plan on writing up how to make this snowflake for a free little pattern for those of you who crochet:) I’m not huge on blocking crochet (or knitting) into perfection…I like the wonkiness of the handmade piece. But for those of you who like to block, I hope you can imagine these snowflakes blocked into perfect little picot wheels. Ooh, I like that. Picot Wheels…makes me think of pinwheels…childhood favorites. Those are awesome! I can’t wait for the pattern. They’ll make nice little Christmas Tree ornaments. and wonderful garland as well. I bet – for those who like – you could even starch them. But I too like the wonkiness (which is probably a good thing, as life seems to be wonky so often!). let’s see-unexpected, unforcasted lovely for today was a late afternoon nap with my husband. this is the best time for napping–you have the satisfaction of having done something with the day already, but no anxiety yet about things that didn’t get done b/c (theoretically, that is) you can still do them that night! Yay! That certainly IS an unexpected lovely for the day. Thanks for sharing it Ellen! Lovely! One year I crocheted a blizzard for our Christmas tree. They still are among my favorites. Those are lovely snowflakes. I agree with you – sometimes its the unexpected beauty around us that makes us feel alive. And that’s the best feeling of all.